Choreography is a challenging art, in some ways a science. It most often takes time and nurturance, and opportunities to stumble and then rise again, for choreographers to reach closer to their potential. 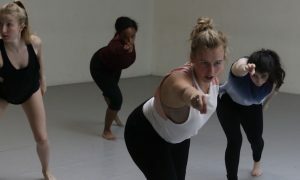 Kelley Donovan’s Third Life Choreographer Series, engaged with the Boston, Massachusetts, area and based in Somerville, Massachusetts, offers all of those ingredients. As a result, area choreographers have grown as artists, as well as expanded their professional networks and audience bases. Some have even been discovered as the hidden gems that they are. On the other side of the performance, more of the area’s general public have been able to experience live dance for an affordable price and in a welcoming atmosphere. A work for the Third Life Series by Choreographer Kelley Donovan. Photo by James Falvo. Donovan wanted to connect with other artists for her own support and partnership, as well as to help make that possible for other artists feeling similarly. 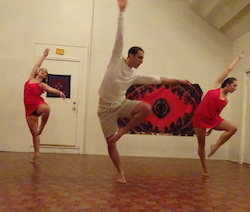 Thus, the Third Life Choreographer Series was born, with the first performance in the fall of 2011. The series began in New York, when Donovan wanted to expand a program of her company, Kelley Donovan and Dancers. She put out a call on Facebook, first to various performing artists, such as poets, then to other dancers and choreographers. “The response was huge,” she recalls. The series then expanded to Boston, as Donovan relocates there every January in order to teach Advanced Modern Dance Technique at UMass Boston. Connections to New York have remained, however, such as with David Parker and his company, The Bang Group. A similar “shared” program, with work(s) from Kelley Donovan and Dancers and other interested choreographers, has continued to be a successful format. 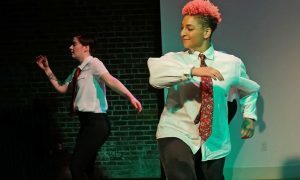 Support from local dance spaces, including Green Street Studio and The Dance Complex in Cambridge, Massachusetts, has also contributed to the series’ success. “I think that the [dance] spaces should work together,” Donovan says. In particular, Donovan asserts that “Sue Robbins at Third Life Studio has always been so supportive and welcoming”. The multi-arts studio in Somerville, Massachusetts, offers a variety of healing and performing arts forms. It gave the series its name. Donovan thought it was a “cool name”, she explains, and she didn’t want to call the series by her company’s name and “Guests”. When asked if “Third Life” has any symbolic, historical or mythical meaning, she says she’s not sure of any. Another essential supporting individual has been the series’ long-standing videographer, Charles Daniel. He hasn’t missed a single performance, for whatever compensation Donovan and her company can offer. He has even traveled to New York and paid for his own lodging in order to film a show, Donovan explains. A work for the Third Life Series by Choreographer Jen Farrell. Photo by James Falvo. The interest in presenting work has been consistently strong, with diverse choreographers always filling the one-hour program. Donovan describes how there’s a steady cohesiveness in the series, however, in a contemporary and contemporary ballet style. Shows have steadily become more frequent, up to once monthly shows with a few months in the year as off-seasons, totaling up to nine performances per year. Donovan skillfully utilizes social media and other internet platforms – including the Dance Action Network email list-serv, YouTube and Facebook – in order to sustain the choreographer and audience bases necessary to sustain this frequency of shows. On the other hand, face-to-face partnerships and experiences are really where it’s at for Donovan. She talks about why dance is known as an “ephemeral” art form, even when it can always be video-taped – because it’s truly something different and unique when experienced live. The Third Life series makes that possible for more types of people in the general public, with very affordable prices and a welcoming, relatively accessible and convenient space. Donovan explains how some regular audience members have been coming for years — their first times attending to see friends showing work. A casual and informal atmosphere also helps to make the performances accessible to all types of folks. For instance, dancers come to sit in the audience after they perform. Donovan describes how that seems to build a welcoming, informal feeling in the space that makes audience members more comfortable with approaching dancers and choreographers with feedback, congratulations or with other forms of beneficial dialogue. In that way, the series also allows choreographers more opportunities to get audience views on completed works or works-in-progress. That seems to be a beautiful and essential two-way exchange. The Third Life Choreographer Series has three upcoming shows this year: a fully produced performance at Green Street Studios (Cambridge, MA) on April 16, a collaboration with David Parker in June (June 3 and 5 at the Oberon Theater, and at The Dance Complex, June 10-11, both in Cambridge, MA) and a September show (at Third Life Studio). To submit a proposal to present work at a future Third Life performance, visit kddcompany.wordpress.com/third-life-studio-choreographer-series. To learn more about Kelley Donovan and Dancers, head to kddcompany.wordpress.com. To check out the Third Life Studio, see www.thirdlifestudio.com. 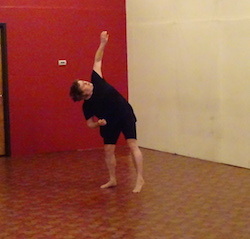 Photo (top): A work for the Third Life Series by Choreographer Wisty Andres. Photo by James Falvo.